It’s a new hardcover book called Animals with Sharpies, created by two of the founding members of the world-renowned collective The Royal Art Lodge. Again, we’re going to defer to their description, since we really can’t top it: “Animals with Sharpies is a collection of paintings with hand-lettered texts. 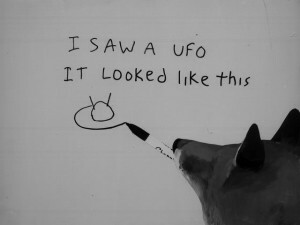 In each painting, Michael Dumontier and Neil Farber have depicted an animal holding a Sharpie, ostensibly writing a message. These messages are varied in nature: Political and religious tracts, confessions, recipes, arithmetic problems, and more. Above all, these paintings are funny, but they are also startlingly poignant and jarring for the humanness of the suffering and longing depicted in these animals’ simple words.” Check it out at Amazon. It’s coming to shelves this June.